Century Box 20X16X1 Inches by Prat at Marco Marcucci. SKU: FSCSB16201. MPN: 1121. Hurry! Limited time offer. Offer valid only while supplies last. Manufactured with 100% acid-free materials to provide the best protection for your art prints, photographs, transparencies and other valuable items. Manufactured with 100% acid-free materials to provide the best protection for your art prints, photographs, transparencies and other valuable items. 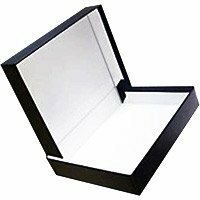 All of the Century Archival Boxes & Albums feature a one piece clamshell construction, offering dust free storage and a moisture and vermin resistant black fabric cover.